Loosen the pad mounting pins (1). 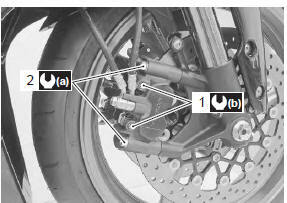 Remove the brake caliper by removing the caliper mounting bolts (2). Remove the pad mounting pins (1), brake pads and spring. do not operate the brake lever while the pads are removed. when removing the pads and pad spring, push the pistons all the way into the brake caliper. Clean up the caliper especially around the caliper pistons. 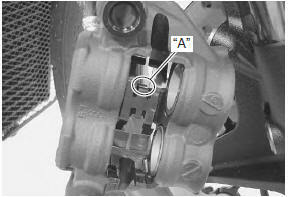 When installing the spring to caliper, bring its wider pawl “a” to top side. Install new brake pads and temporarily tighten the pad mounting pins. 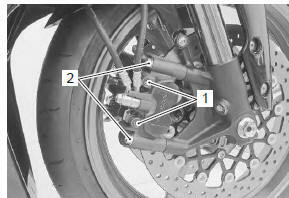 Tighten the front brake caliper mounting bolts (2) and front brake pad mounting pins (1) to the specified torque. after replacing the brake pads, pump the brake lever several times to check for proper brake operation and then check the brake fluid level.